Episode: 30. Site Number: 084. Date Posted: 7 December 1996. Location: 1 Kensington Gore, London, England. Type: Institution. 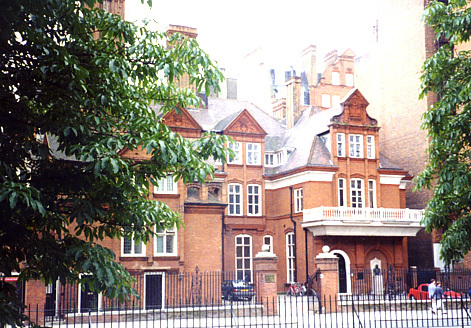 The Royal Geographical Society's house at 1 Kensington Gore, London, is a treasure-trove of Antarctic memorabilia, over and above the numerous journals, logbooks, correspondence and such manuscript material with which it is richly endowed. Items associated with Robert Scott are in abundance, including medals, a horse shoe and a matchbox. His chemistry set is there, including containers of chemicals, a mortar and pestle, funnels, etc. (see Geographical Journal, July 1913). There are canvas bags with the wax seals of the RGS: inside are tea and pepper, provisions from the 'last camp;' also a small cylindrical sextant telescope, left by Amundsen at the South Pole. On the Exhibition Road facade of the Society's house is a bronze statue of Shackleton set in a niche. I'll leave that to another episode of The Low-Latitude Antarctic Gazetteer.